MKThink is dedicated to developing designs and strategies that improve the quality of life. We are constantly looking at new techniques to tackle the issues that affect the built environment. Recently, we leveraged Google Trends to extract data from the ubiquitous Google Search engine. In conjunction with other analytical tools, Google Trends provides valuable insights about target communities. Fellow Thinker Emma Decamp’s article highlights the disproportionate impact of heat waves on low income communities. Below is a demonstration of a process to identify strategies to aid communities in California exposed to a high risk of heat stress (left) and below the poverty line (right). Counties in California are ranked based on increase in projected number of extreme heat days (days with heat index greater than 85th percentile) by the year 2025 and density of people living below the poverty line. Overlaying these two metrics helps identify vulnerable areas where high densities of low-income communities are susceptible to an increase in the number of extreme heat days. An analysis of search trends for a variety of cooling technologies and solutions in these vulnerable areas and drawing correlations between Google Searches for “air conditioners” and other searches during the summer months showed differences in search habits of the regions. 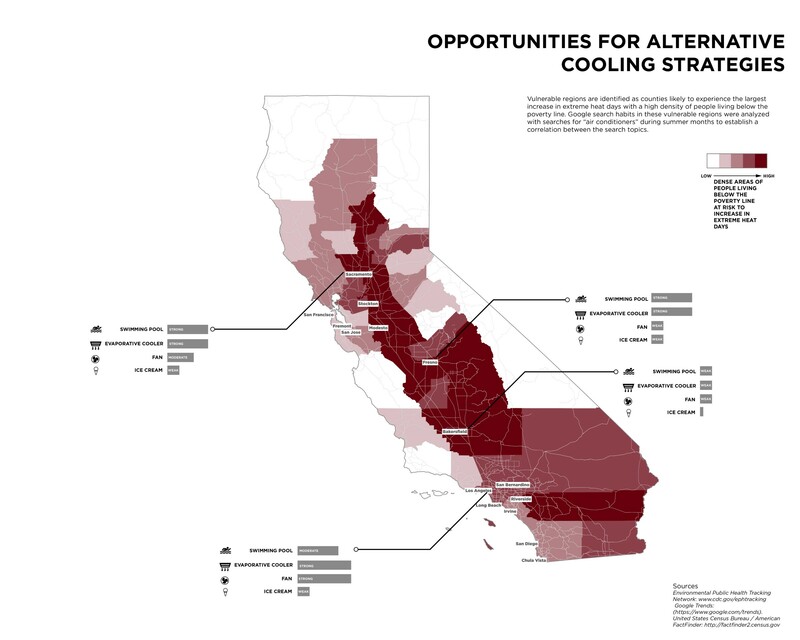 The metro regions of Los Angles and Sacramento are more likely to search for alternative means to stay cool during the summer than Fresno or Bakersfield, indicating varying levels of receptiveness to, or familiarity with, alternative cooling strategies, such as passive cooling. These findings act as preliminary guide about the receptiveness of regions to the adoption of alternative cooling strategies and can inform where awareness program should be targeted.